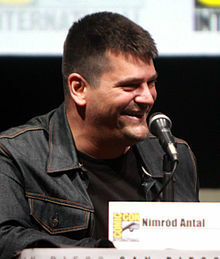 Nimród E. Antal (Hungarian: [ˈnimroːd ˈɒntɒl]; born November 30, 1973) is a Hungarian-American film director, screenwriter and actor. Antal was born in Los Angeles, California, to parents of Hungarian ancestry. In 1991, following his father's advice, Antal moved to Hungary to study at the Hungarian Film Academy. After graduating he began work in the film and television industry; in 2005, he returned to Los Angeles and continued to work in the film and television industry in Hollywood. Antal wrote and directed the Hungarian-language film Kontroll (2003), which won numerous awards, including the Award of the Youth at the 2004 Cannes Film Festival and the main prize at the Chicago International Film Festival, as well as a European Film Award nomination for Best Director. The backdrop of the film is the Budapest Metro subway system. Kontroll, refers to the act of ticket inspectors checking to ensure a rider has paid their fare. Antal's first American feature film, Vacancy, starring Kate Beckinsale and Luke Wilson, was released on April 20, 2007. His second American film, Armored, was released in December 2009. Robert Rodriguez hired him to direct the film Predators. He directed the Metallica 3D concert movie/narrative story titled: Metallica Through the Never (2013). Antal began shooting a biopic about infamous Hungarian bank robber Attila Ambrus in 2016; the film, called A Viszkis, is slated to be released in 2017. Antal has appeared in acting roles in some Hungarian films, the most known among these are András Salamon's Közel a szerelemhez (1999) and Balra a nap nyugszik (2000), directed by András Fésös. Antal had major supporting parts in both of these films. He also had a cameo in Robert Rodriguez's 2010 film Machete. ^ Knoerer, Ekkehard. "Nimród Antal: Kontroll (Ungarn 2003)". jump-cut.de. ^ "project: equinoX - v3.0 » Motel, David, Wilson, Luke, Kate, Beckinsale, Paar, Mason » Sony Pictures: Nimród Antal´s - Motel am 19. Juli im Kino » Von chilidog". chilidog.project-equinox.de. ^ Kasch, Andrew. "Preview: Robert Rodriguez and Nimrod Antal Talk Predators". DreadCentral. ^ Bálint, Kovács. "Kirúgja az ember alól a széket A Viszkis első előzetese".